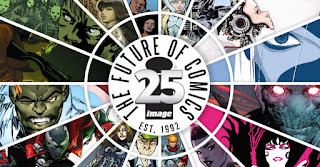 Image Comics and ReedPOP, the leading producer of pop culture events are pleased to announce that original Image Comics company founders Todd McFarlane, Jim Valentino, Erik Larsen, Rob Liefeld, Marc Silvestri, and Whilce Portacio will reunite at Emerald City Comicon 2017 to celebrate the company’s milestone 25th anniversary. The panel will be moderated by Walking Dead creator and Image Comics partner, Robert Kirkman. The Image Comics founders will come together for a very special ECCC panel on Friday, March 3rd from 1:00–2:30 PM. The panel will focus on the origin story of the company when, 25 years ago, a group of comics artists looked at the difference between what they were capable of and what they were being given, and left the promise of steady work for new pastures. The result was Image Comics, which has grown from an upstart group to a comics publisher that has changed the course of the industry. Image's 25th anniversary year begins with this special event, a rare gathering that is not to be missed. Following the panel, there will be an exclusive signing with the Image Comics founders in the Grand Ballroom at the Sheraton Hotel located next door to the Washington State Convention Center from 3:00–4:30 PM. ECCC will coordinate a ‘lottery system’ where badge-holding fans will submit their names and a lucky 300 fans will win a limited edition poster and admission to have it signed by the founders. Lottery applications are open on the Emerald City Comicon website until February 21st.